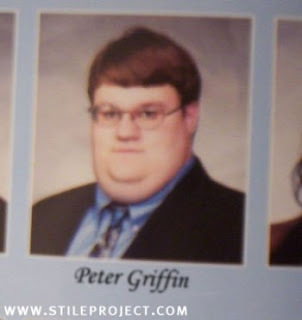 For absolutely no reason whatsoever, I thought I would post the picture of the real-life Peter Griffin for you Family Guy fans. The resemblance is uncanny. Nice to see Gibson getting his due. He’s been first on every Pac-10 preseason team I’ve seen. We highlighted it the other day, but Oregon’s secondary is pretty stacked. 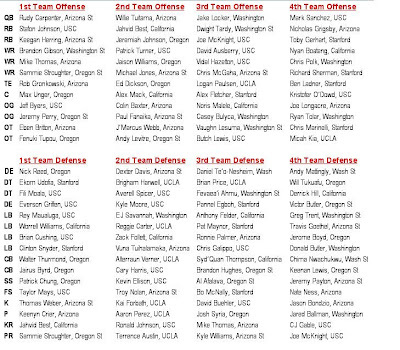 USC, big surprise, has the most all-league picks, with 23. WSU? Last, with 7. Again, big surprise. “The most overpaid coach, when comparing dollars to wins? Washington’s Tyrone Willingham. Tyrone’s 1.47 million seems awfully high for a guy who’s gone 11-25 and still has his job. But given the 1-win disaster he took over, I think it is unfair to judge him purely on the record. Like it or not, he’s drastically changed the culture, and went way outside the box to bring in a top-shelf d-coordinator this year that should pay instant dividends. I know, “UW FOOTBALL BLOG EAST” or whatever you want to call it, but it is what it is. “Riles” as the most underpaid is accurate as well. We’ll get into the Beav’s more in the next couple of days with another spring fish wrap, but to think that he coaxed 9 wins out of that team last year with all that was going on is a fantastic coaching job that cannot be understated! Finally, John McLaren had a Jose-Guillen-like meltdown of epic proportions yesterday, after getting ripped by Chuck Armstrong before the game. The only thing I can say is what took you so long John?? Someone pointed it out yesterday in comments, but Jose Vidro hitting 4th?? Brutal. Jose Vidro shouldn’t hit 4th on my son’s coach-pitch team, but to think he’s the starting DH and hitting 4th on an AL club is just mind-blowing. That shows how poorly this team has been put together, and you just have to wonder how much longer this will go on. Maybe after today’s MLB amateur draft they will blow it up. The worst thing is that it seems like they really don’t have a clue as to what to do to turn it around. Chuck Armstrong gave Bavasi and McLaren very loud votes of confidence a few weeks ago, decisions that look worse by the day. I heard Pat Gillick interviewed on KJR the other day, about how he said it was too early to give up on 2008 and you have to wait until at least the All-Star break. HUH? 15 games out, worst record in the bigs and it’s June 6th. IT’S TIME. You are currently browsing the archives for the John McLaren meltdown video category.